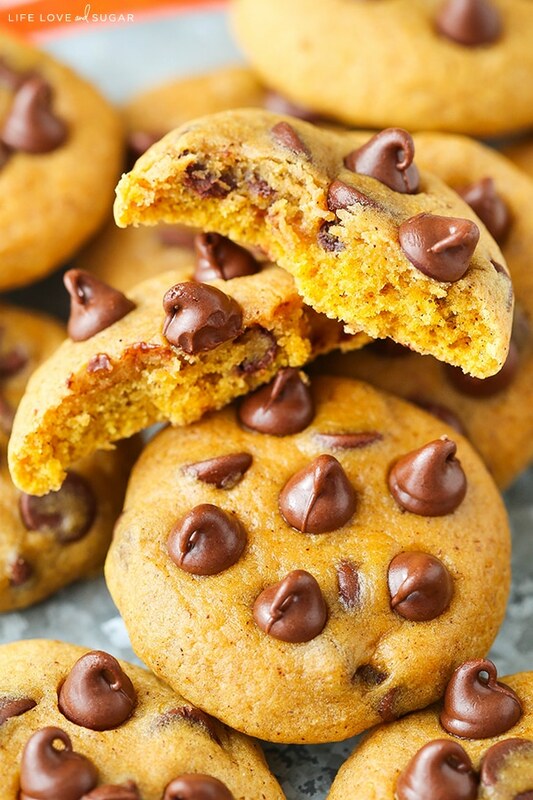 These Pumpkin Chocolate Chip Cookies are soft and chewy, and so full of pumpkin flavor! 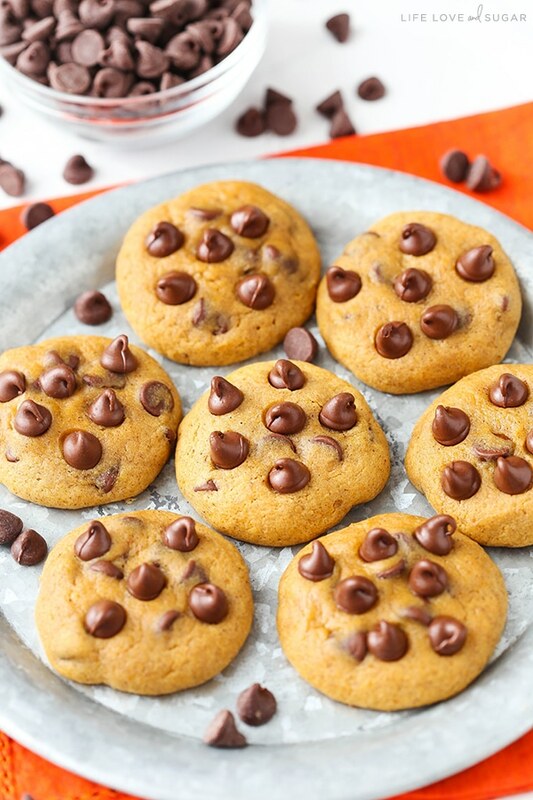 They are my new favorite cookie for fall! 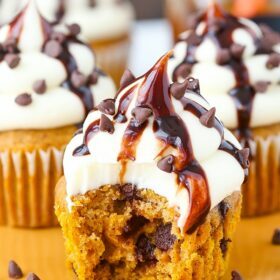 So let’s talk about pumpkin for a bit, because adding it to baked goods really changes up the game quite a bit. In fact the pumpkin cake recipe that I developed for my cookbook is one of the most tested recipes in the book for exactly that reason. 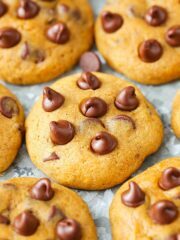 And these cookies were no exception – I went through so many versions of these before I had the perfect one! And I have to tell you I am in love with this final version! 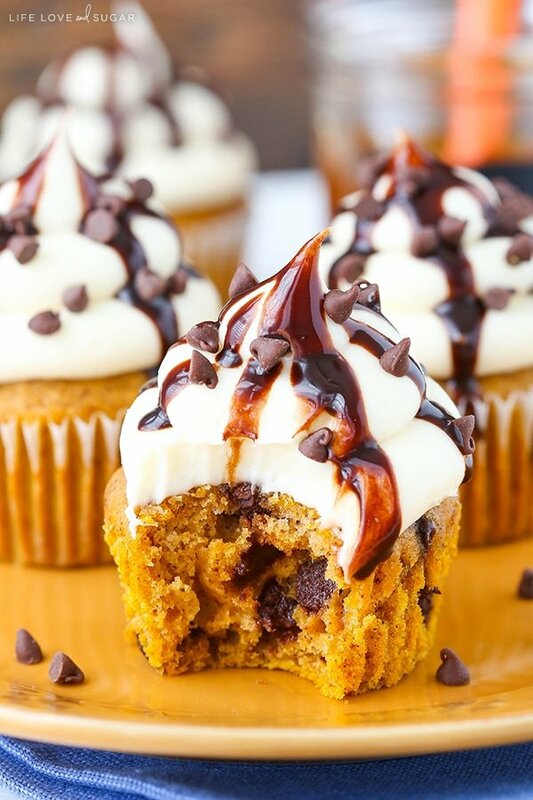 Pumpkin in baked goods acts a lot like a leavener. Plus it’s got a ton of moisture. So when testing these cookies there was a lot of experimenting with the amount of pumpkin, flour and the amount of eggs and baking soda. I actually have a pumpkin cookie that I posted last year that was the base that I started with for this cookie. 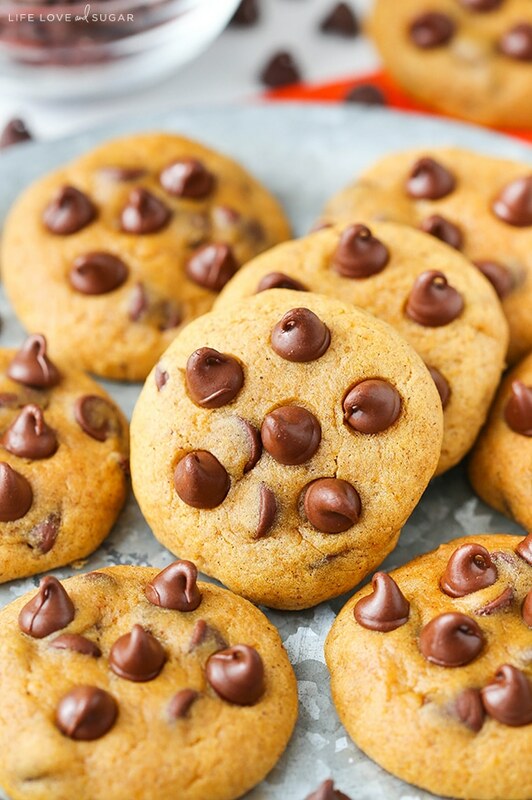 That cookie had more pumpkin and flour, and used an egg instead of baking soda. That cookie is a little puffier and denser. I changed it up and now these are a little less dense and puffy and more chewy. With pumpkin cookies it can be hard to keep them from being cakey, like these cookies which actually creams the butter and sugar, so there’s been plenty of experimentation. Ultimately after testing this recipe six or seven times, I decided to forgo using any eggs and use a little bit of baking soda instead. The pumpkin already does plenty of leaving on its own. The small amount of baking soda gives it a touch of lift without making it denser and adding additional moisture like an egg, so that was all I needed. I also reduced the final amount of pumpkin by just a touch. 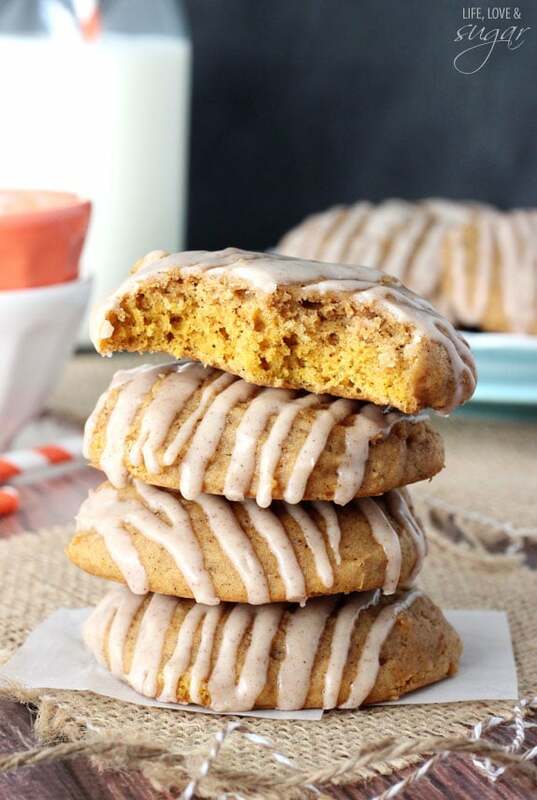 There’s still plenty of pumpkin flavor but not so much pumpkin that you ended up with a more cakey cookie. At one point I had thought I was all done! I was really happy with the cookie, then I had a friend try them and she was surprised by the ginger in the cookie. I was surprised that she was surprised. 🙂 So I started testing again and played with the spices a bit. I have to say, I much prefer the ginger over the there versions I tried. It just wasn’t the same without it. But if you prefer something else feel free to switch it up. 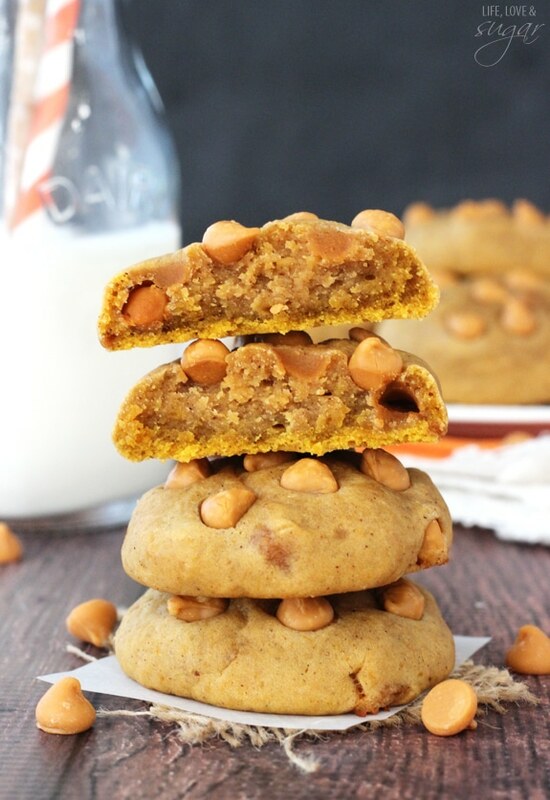 For me, the flavor and amount of pumpkin in this cookie is perfect! They are soft and chewy and get softer and more delicious after sitting for a day. I really do love them and I hope you do too! The final version was definitely a hit with our church group! 1. Preheat oven to 350°F (176°C). 2. In a large bowl, whisk together the melted butter, brown sugar and sugar until well combined. 3. Add the vanilla extract and pumpkin puree and whisk until well combined. 3. Add the flour, spices, cornstarch, baking soda and salt and mix together with a spatula until well combined. 5. 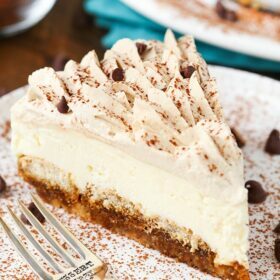 Refrigerate for about 30 minutes to an hour. 6. Make balls of 1 1/2 tablespoons (or a heaping tablespoon) of dough and place onto a cookie sheet lined with parchment paper or a non-stick baking mat. Pat the balls of dough dough to flatten them just a bit. 7. Bake for 8-10 minutes. The edges should be firm and the center may still look a touch undercooked, but will continue cooking and firm up as it cools. 8. 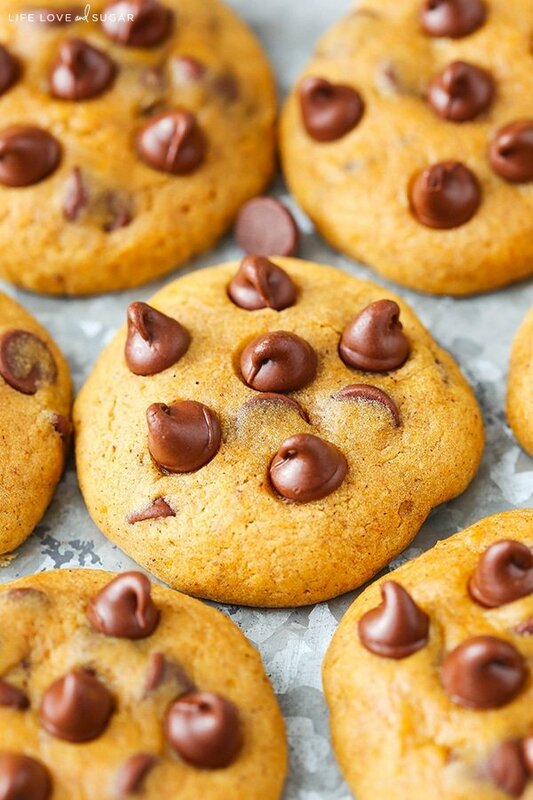 Remove cookies from the oven and allow to cool for 5-10 minutes on the cookie sheet. 9. 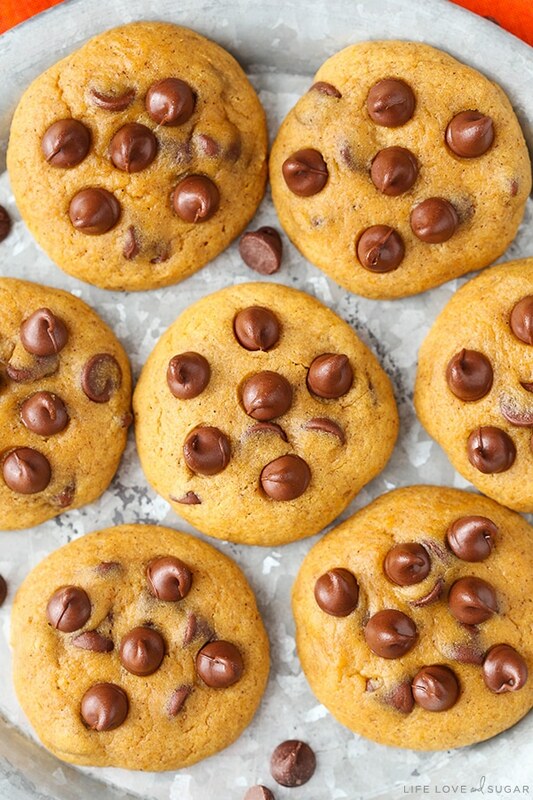 Move cookies to a cooling rack to finish cooling. 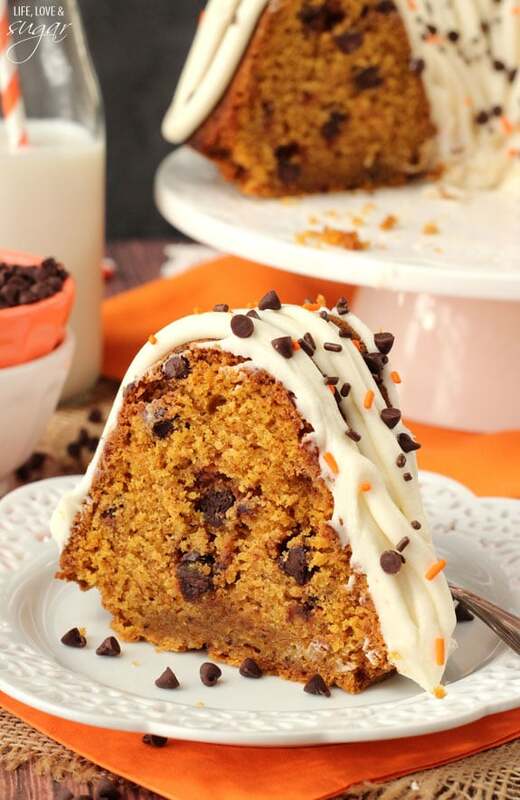 Pumpkin Chocolate Chip Scones from What’s Gaby Cooking? 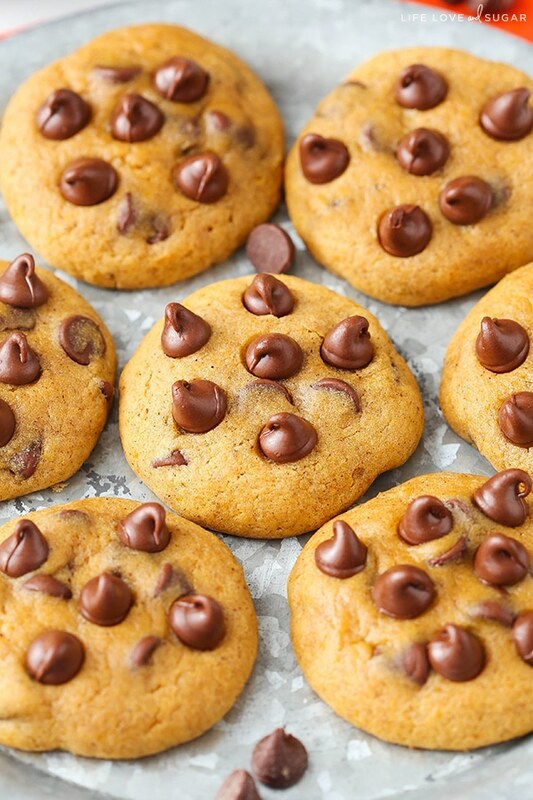 These cookies look so soft and moist! 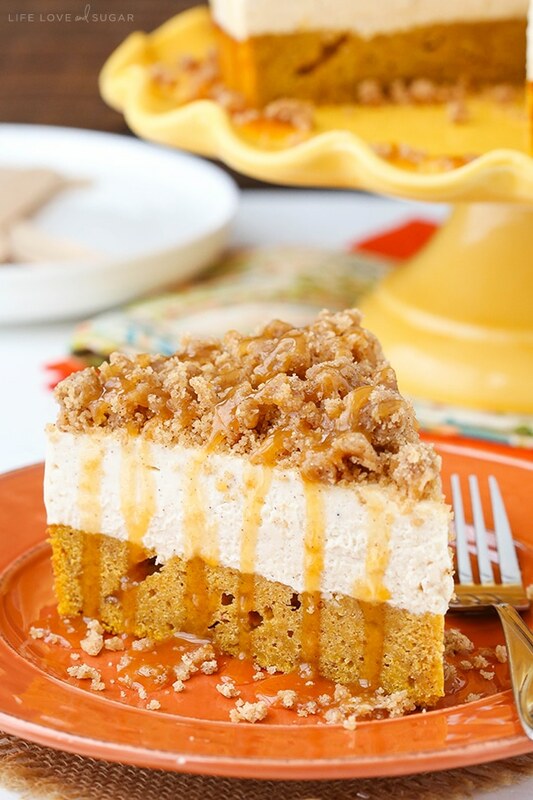 I love all of your featured pumpkin recipes. These were so good! The ones I made tasted wonderful, but definitely didn’t look as beautiful as yours, but great recipe. I’ll just have to perfect it ;). I don’t actually. I’m sure you could find one online though. I imagine you would cook the pumpkin and puree it.